Customize your ad monetization with server-side demand management tools. Take instant action on your direct ad network deals with Fyber’s flexible and comprehensive demand management tools. You can top-rank ad networks in specific countries, set eCPM guarantees from ad networks, and sell your valuable first impressions at a premium. Combine manual settings with overall automation to build an effective, customized monetization strategy. All changes can be executed directly from the Ad Monetization Dashboard with just a few clicks, without having to touch a single line of code. Discover ad monetization opportunities across all demand sources with easy-to-use analytics and reporting tools. Get an immediate birds-eye-view of your ad revenues, ad networks, and top performing ad formats so you can take immediate action. Break down your data by app, country, ad format, and ad network to analyze which channels are performing and instantly optimize for the best results. Design the most engaging, relevant user experience. User segmentation tools help you categorize audience based on app usage, behavior, and demographic data to deliver a targeted, relevant ad experience so you can extract the maximum value from every view. An industry-first for mobile that removes the pain for heavy video loads that can slow down your app performance. Use the advanced pre-caching controls to reduce data and memory usage, cut load times so your video ads won’t impact your app’s performance. Same as everyone else on here. The Fyber team are liars and frauds. Im having similar issues others have, the app i play uses Fyber to award credits for completing offers. i did all the required steps have my proof and screen shots. I reported an offer not working and waited weeks for no reply, i started another offer to report the original one. They told me i had to wait for the email connected to the offer to show or they cant do anything. Which is a lie. Upon completing another offer i had to again message them and this time i got a reply and so i rereported the first offwr with this last one. I have my emails dated and i have screen shots to prove it says they sent me a email i never received, that i completed my offers, and got no credits. They said they were gonna help but then told me too much time has passed for them to help me with the first offer. However i had messaged them the day of to which they didnt respond to or seemingly care about. i've caught them in several lies and they just outright refuse to help. I spent money to complete these offers and they are being children about it. Lets call this what it is when you pay for something then the buyer tells you you wont recieve a refund or the item purchased. A SCAM. THEY ARE A COMPANY WHO MAKES MONEY BY CHEATING THEIR CUSTOMERS. 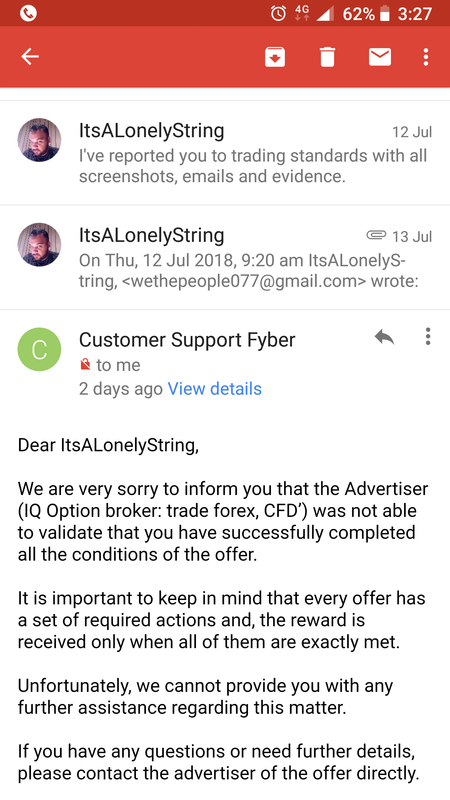 Payed for an offer which my reward never came through, spent 2 weeks sending over 20 screenshots before they accepted my proof and then told me to wait two weeks, has been over a month now and keep getting the same response telling me to keep waiting and have patience, have contacted the company of who I made the purchase with and they told me they confirmed the offer over 3 weeks ago of which Fyber will not make a response. Twice I've completed big offers in a game called Racing Rivals. Both offers came to a total of 20k gems which is around £180-£190 pounds worth. I've been back and forth through emails and sent every piece of evidence they've asked for to complete the offer. After about a week of bs emails and sending them everything they asked for, they finally told me that they wouldn't pay up and that they contacted iqoption saying the offer wasn't completed. Lying straight away because I contacted iqoption and they confirmed that I completed the offer.. So here I am leaving a bad review of the company where we I can. I also luckily managed to get refunded by my bank. I am rarely rewarded diamonds after fulfilling offer requirements. Maybe 2 out of 10 offers. If you file a report you get a tag saying an email has been sent to your address. I have NEVER received an email in my inbox or my spam folder. So I have no way of communicating with them about the lack of diamonds received. Absolutely horrible service! Hoping the game I play will switch to a different service soon. One that will actually deliver what it promises. Only had bad experiences with Fyber. 90% of their offers do not pay out. Reporting diamonds not rewarded and actually receiving them is an utterly frustrating process. Fyber demands proof, very often proof that does not exist (such as confirmation emails) and will make you jump through hoops and then tell you the 20 screenshots you provided are still not enough proof. Thus not paying out. Sometimes they sent an email saying diamonds will be rewarded within a couple of hours, yet they aren’t. Absolutely horrified by the way this company treats people. Needs to be shut down ASAP. Criminals they are. Video ads are the best feature of Fyber. They understand that our mobile app users don't want to sit forever waiting for a video ad to load. They just load faster with Fyber.